Mark, from Sulphur Springs, Texas, is 21 years old. 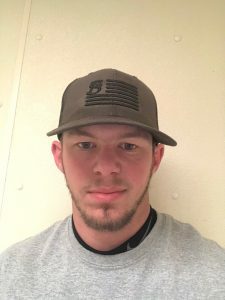 He graduated from the Welding Specialist with Pipefitting program at Tulsa Welding School & Technology Center in Houston in July 2017. He went straight out of high school into welding school. Thanks for your time, Mark. What made you consider welding as a career? I struck my first welding arc as a sophomore in high school. I thought it was kind of fun. My father showed me a little bit as well. Then an admissions representative from Tulsa Welding School came and spoke with us at school. I thought one day a week in the classroom and the rest in a shop could help me out a lot. I’m not the type of guy who likes to do book work. I’m happier in a shop. The hands-on approach of Tulsa Welding School really appealed to me. Did you think of it as a possible career at that age, or was it just cool? It was a little of both. I did think it was something I could maybe make a career out of and make some good money doing, especially when the recruiter said that we could learn about all the different types of welding at Tulsa Welding School. It was fun. I got to learn how to weld going through all the phases. My number one favorite process is TIG welding, though. I had several great instructors up there, and I enjoyed the competition with the guys in class and competing with myself to get better. I like to compete. I first enrolled in the Welding Specialist program, but I decided to stay on once I started getting into it. I made the decision to stay and do the Pipefitting course when I was in the last phase of the welding program, and I’m glad I did. I wanted to learn how to read blueprints and learn the different techniques of how to work with measurements, angles, different sizes and types of pipe. I figured it would bring me more opportunities down the road. I work for a company named Sulta Manufacturing, a custom steel fabricator right here in my home town, Sulphur Springs. I do MIG and flux core for the. I’ve done some structural welding working on stair wells and rock crushing chain mills. I’ve worked on I-beams as we—46 footers and stuff like that. I started with them in October last year. Was that your first job after Tulsa? Actually, no. I started out doing some structural welding for a guy, but that job ended. Then I went to a trailer place but decided that wasn’t a good fit for me. That’s when I moved to Sulta to pick up some good experience. It was a pretty decent check! I didn’t think that I could paid that well for doing something that’s this much fun. To get paid well for something I’d do for free is amazing. Did you do anything fun with it? I’m kind of sensible with my money. I’m trying to get my student loans paid off right now. Then I want to work my way up to a new truck. I’m living with my folks at the moment, saving up and just trying to get my loan paid off. At some point, I will probably move back to Houston. I’d like to move on and do something different with MIG and Flux and do some Stick or TIG welding. You can make quite a bit of money, but it does depend on the job you’re working on and the materials you’re working with. But I also get a sense of satisfaction from making something. It’s a great career, and going to Tulsa welding School is a great way to learn how to start welding. If this is something that you really take pride in, and you really want to make a good career out of it, this is a good way to learn and get hands-on training. The instructors, the staff members—everyone is willing to help you. There were times when I needed one-on-one time with an instructor, and they’ve actually gone in the booth with me and showed me how to do whatever it was I was struggling with. They also teach you all about the basic safety and the protection you need to wear. This is the absolute best school to be at if you want to be a welder.